ROER4D is a big research project. There are 18 sub projects and there are 86 researchers working across 26 countries and 16 time zones. For a lot of the people who have travelled to Banff, Alberta in Canada this is the first time they have met face to face, and about half of them are new to me. The range of data collected by the project is diverse, and to maximise the chances of combining data in useful ways will be increased by co-ordination of methodology and research practice where possible. Some aspects will be highly contextual but where possible the project should strive to identify themes held in common. Some research questions will be emphasised in some strands more than others but there is still value in pulling together all the relevant data for the key project clusters. By mapping what is already known and sharing this throughout the project everyone should benefit from not having to tackle al the research in isolation. The different aspects of the project should complement each other. This workshop provides an opportunity to create new connections and better coordinate across the project. 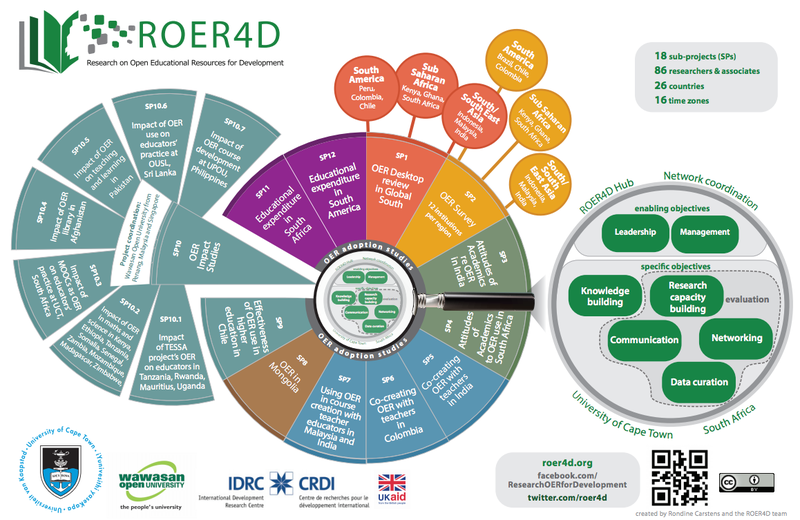 The workshop will focus on updating the collective understanding of progress made so far; sharing ideas for data analysis and data visualization; and discussing the ROER4D final outputs and their anticipated formats. 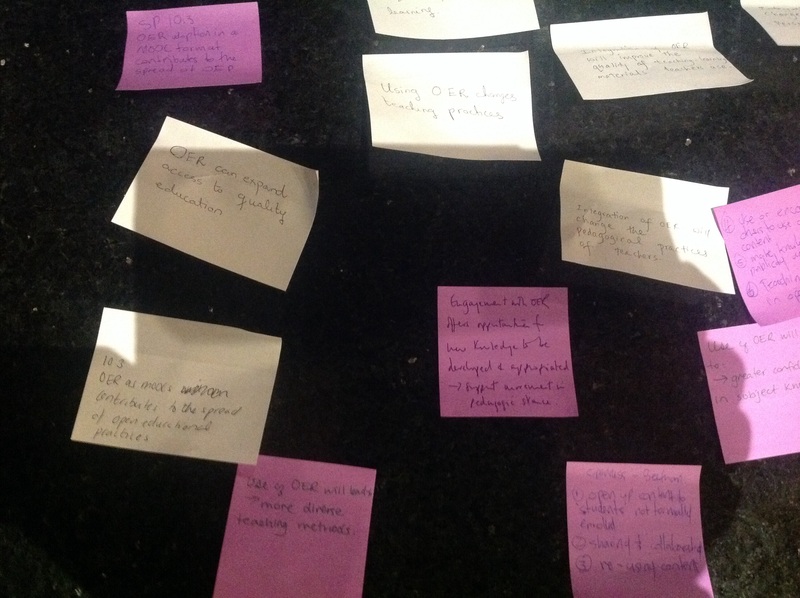 There are several projects looking at specific areas of OER impact and opportunities for working together on similar issues and themes should be identified. There was some interest in the OER Research Hub survey questions so I made these available to some of the group via http://tinyurl.com/OERRH-surveys. Anyone is free to re-use our questions under a CC-BY licence – we only ask that attribution back to the OER Research Hub project is forthcoming in return. After some brainstorming work the main objectives for the workshop were identified. Most are keen to try and establish agreed methods for data curation and analysis which can be applied consistently across the project. Another theme that emerged was the idea of making best use of any data collected through a consistent strategy for exploitation and evaluation. Sarah Goodier presented some work on the workpackage which looks at the role of public funding in supporting OER adoption and advocacy in South Africa. This comprises desk research and interviews with policymakers and officials. A country report is expected early in 2016. This presentation provoked some collective reflection around the difficulties of building up a holistic picture of change. SP10.1 Freda Wolfenden (UK) – the OU team will work with teacher educators in West Africa to understand their engagement and response to OER, looking for changes in their understanding of their own practice; their understanding of their own subject; and social order changes within and beyond their institution. The data will mostly be self-reported by teachers in training and will include attitudinal data as well as self-reported changes in practice. Some baseline data will also come from more general surveys. SP10.2 Atieno Adala (Kenya) – this study looks at the impact of OER adoption on expanding access to quality teacher education in sub-Saharan Africa, where there is a lack of well trained teachers. 12 universities across 10 countries will comprise the locations for the study. Some existing research (e.g. Diallo, 2013, Niang, 2013) suggests that access to an improved curriculum can strengthen institutional capacity. Evidence will be sought to defend this claim. The secondary hypothesis will examine whether OER has a positive effect on the quality of the curriculum. A quantitative analysis of student performance and institutional reporting will be used as evidence. SP10.3 Michael Glover (South Africa) – study of 3-5 MOOC at University of Cape Town, which is developing a wider MOOC strategy working with FutureLearn. How do adoption of OER (in a MOOC format) impact upon educator practices? The study will focus on post-MOOC teaching and research practices. The definition of open educational practices by Beetham et al (2012) which identifies six indicators for OEP will be used to measure changes in practice. Generally, this seemed like a good approach to measuring impact of this sort. Interviews and classroom observations will also be conducted, and analytics from the MOOC portal collected. Activity theory will be used as a conceptual framework. SP10.4 Lauryn Oates (Canada) – Canadian Women for Women in Afghanistan is running the ‘Darakht-e Danesh‘ programme which makes educational materials available openly as an online library. Once registered, users can search for OER by type of resource, subject, language, etc. The research will focus on whether access to OER improves teacher subject knowledge or pedagogical practice. Analytics from the website will provide most of the data for the impact study, with surveys as a follow up. SP10.5 Yasira Waqar (Pakistan) – investigating impact of OER on secondary and tertiary education in Pakistan. OER is not popular in Pakistan and possibly associated with ‘devaluation’ of intellectual work (because it is ‘given away’). Open access is less of an issue in Pakistan as copyright is not particularly well observed or respected. (It might even be that ‘open’ in Pakistan just means ‘free and online’.) The main research questions here try to evaluate impact by measuring adoption and identifying benefits to educators and learners, using Fullan’s theory of change as a framework. Interviews, surveys and classroom observations will be used to collect data about changes in pedagogy, but it will be important to demonstrate the specific efficacy of OER. SP10.6 Shironica Karunanayaka (Sri Lanka) – the concept of OER is new to Sri Lanka, and this study will introduce teachers to the concept and ascertain whether or not this leads to some changes in teaching practice. The hypotheses being investigated is whether integration of open materials into teaching leads to a change in perception of the practices of student teachers and improved quality of teaching and learning materials. An action research approach will be taken following a professional development programme for student teachers. The day concluded with discussion in groups according to the different workpackages across the ROER4D project. Because of the structure of the World Cafe session, it meant that the presenters did not see the presentations of others. We had a discussion around ‘impact’ and the difficulty of establishing a causal relationship between adopting openness and the impacts that result. It was felt that a general theory of impact as ‘change’ could be a practical way of proceeding and specificity can be brought out in the subsequent analysis. Of course, there are other possible ways to perform this categorisation (.g. 6 might be reducible to 1. ), and it could be further broken down by subject and teaching level. Wordings of survey and interview questions should be as consistent as possible, and demographic questions should be absolutely consistent across both the impact studies and the ROER4D project as a whole. The project leaders agreed to work together to harmonise their questions across the key hypothesis areas. The OER Research Hub question bank might provide some inspiration for the wording of questions asked across the impact studies.